Margaret Olley fine art works on paper – collagraph print titled – Still Life and Flowers, Plums and Oranges, released in 1998 – Image size 65x69cm – Paper size 77x105cm – Plates 9 – Colours 80 – Edition was limited to 50 only. 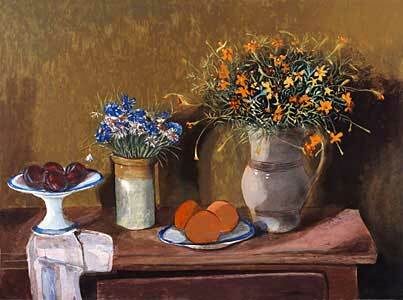 Still Life and Flowers, Plums and Oranges fine art print at Etching House. Hand signed Margaret Olley Fine art limited edition etching and Giclee digital reproduction prints are also available at Etching House, Lay Buy welcome.